Co-existence???? 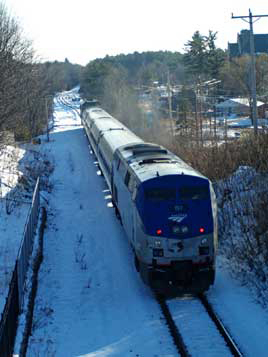 Here's the Boston section of the Lake Shore Limited pulling out of Worcester's magnificent Union Station and passing a CSX freight on a frigid Sunday in February, 2006 . It got us thinking about the precarious state Amtrak is in and how hard it will be to have world-class intercity passenger rail in America. The Lake Shore, like many trains, is constantly 'put in the hole' or stuck behind slow moving freights, huge cash processing machines like CSX and Union Pacific have let their infrastructure deteriorate, causing endless delays (some surpassing 24 hours) and derailments. 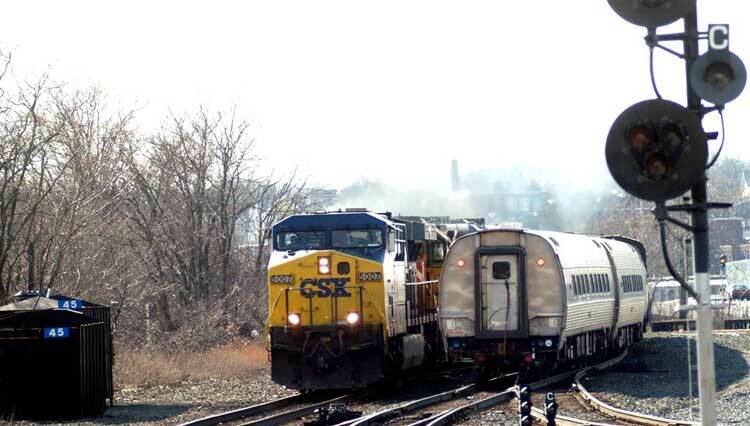 CSX has even put a stranglehold on new commuter service in the Boston area, and there have been endless struggles between the Union Pacific and the State of California to improve timekeeping and allow Capitol Corridor and other much-needed services to grow. In many cases the issue is not money -- some states have plenty and want to expand services -- but poor railroad management and a 'passengers be damned' attitude typical of the old days and more than a few legacy airlines. The irony, of course, is that the Bush Administration, with Amtrak management compliance, is all over Amtrak to adopt corporate efficiency models, and is even trying to micro-manage whether and what passengers have for breakfast -- while it seems to look the other way in terms of applying such models to its own management and that of the freight lines which have gone into disrepair to a damaging degree. 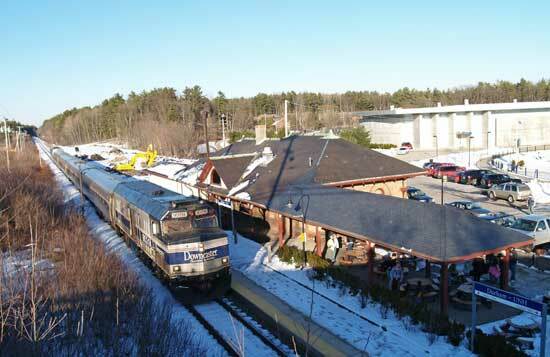 Of course, not all private railways pose such a threat to Amtrak. BSNF, one I can name, does a pretty darn good job. This all brings us around to the need for a country like ours to have more corporate responsibility and a much better balance between public and private interests. For now the corporate board rooms are in control, but any reading of our history shows the worm can turn -- and will. Central Massachusetts, where I live, is a place of enormous beauty, laced with forests, reservoirs, ponds, farms and pretty towns. Of course, we have the problems of growth and sprawl, and one does have to escape some pretty crowded highways to enjoy it all. Mill Pond in Westborough is one of those beautiful places. A reclamation area with only one or two houses on its shore, it is known for first-rate bass fishing, and is a home to swans, geese, ducks and large numbers of great blue herons, who nest in the branches of old trees. But there is more to see than nature. 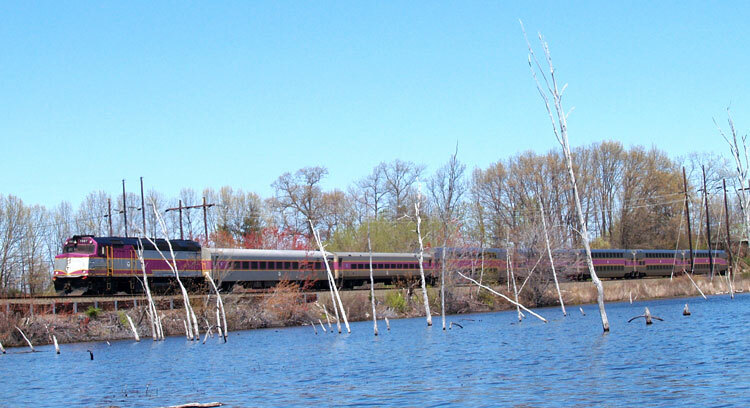 The CSX line between Boston and Albany runs along the pond for a couple of hundred yards and so on a beautiful Sunday afternoon in late April, 2006, I was able to paddle my little pack canoe to it and photograph this Boston to Worcester MBTA commuter train shortly after it left the relatively new Westborough station. A few minutes earlier, and before I could get into a good location due to high winds, Amtrak's Lake Shore Limited's Boston section cruised through. Photos like this remind us that a train can grace the environment in beautiful and utilitarian ways, particularly in these days of high gas prices, the ravaging of the landscape by the automobile, and the sheer hassle of getting from one place to another. It also reminds us that in a time when intercity trains are pretty dull to look at and photograph, burgeoning commuter lines offer interesting designs and, in the case of our service on the Worcester line, new and gleaming equipment. It doesn't get too much better than this. If there is a more beautiful indoor public space in the world than New York's Grand Central Terminal, I haven't seen it. Opened in 1913 and used by over 500,000 people per day, it has been lovingly restored and done so with considerable taste. Not all that long ago beautiful flyers like the 20th Century Limited made it a portal for the rich and famous but intercity trains are gone and sadly, if one takes the line up towards New Haven, which we were doing on the May, 2006, day on which I took this photo, one finds rickety tracks and commuter trains probably decades overdue for replacement. Happily, the State of Connecticut will be making major new investments. Stand on one of the balconies with admiring visitors from all over the world and one is left with the hope that this restoration, new investments and talk of bringing Long Island trains into GCT are a harbinger of things to come on American railways, and perhaps in the country as a whole, where Americans cry out for passenger rail. What, then, a better scene to wish America a happy birthday on July 4! Changes last made on: June 8, 2006.